It most yoga classes you might hear the teacher say something along the lines of “this is your yoga” or “find your edge” or “you are exactly where you need to be.” I never connected with those phrases before, but this weekend I fully realized that this is my yoga. I can go deep into a pose as my body will allow or I can take the opportunity to step back into a relaxation pose. For instance, I don’t always need to get into wheel and that legs up the wall is just as important and affective. I also realized the importance of going to my edge of a pose and not my neighbors. This is also what the phrase “this is your yoga” means. While I do believe our neighbors can provide a sense of calm and flow, they should not be a source of where you should be in your practice. There is huge benefit in practicing from your edge. The deeper I get into my YTT classes the more solid my decision to be a yoga teacher becomes. I’m excited to go to class and learn. I love interacting with my fellow trainees and my teachers. The first half of YTT started as usual with a yoga session and feedback. The yoga teacher that teaches Friday nights has been a teacher since March 2018. It’s fun to see how she has progressed and improved as a yoga teacher since I first started taking her classes in October. The second half of class was spent catching up from our last YTT and homework discussion. For homework, we were tasked with asking up to 5 people questions regarding our strengths. I interviewed my husband, mom, and a friend. It was interesting to hear what they believed my strengths are and where I can improve. We were also asked to think of a way in which we can upgrade. I really enjoy the self-study aspects of YTT. It’s probably my favorite besides asana and meditation. I know some people love chakras, or anatomy, or meditation. My favorite is self-study and philosophy. For the last portion of class, we had to write a 10-year vision. This was the first time I have written a 10-year vision. I was surprised at how easy my ideas flowed. I thought for sure I would struggle with limitations. Have you ever completed a 10 year vision? Saturday morning began with a yoga session and feedback. We then discussed how we could use our 10-year vision and work backwards to form goals. After lunch, we broke down poses, learned how to assist those poses, and modifications. Sunday morning was different than our usual meditation. We began the day with practice teaching. This was the moment that I began to have more confidence in my ability to teach. I changed a few of the poses from the ones I had memorized. It was then that I realized I know more than I give myself credit for. It comes down to believing in myself. After practice teaching, we had a yoga session followed by feedback then lunch. After lunch we had a quick anatomy discussion then an arm balance and inversion workshop. We were taught drills to strengthen our core and will ultimately lead us to accomplishing the poses. We ended class with a guided meditation. 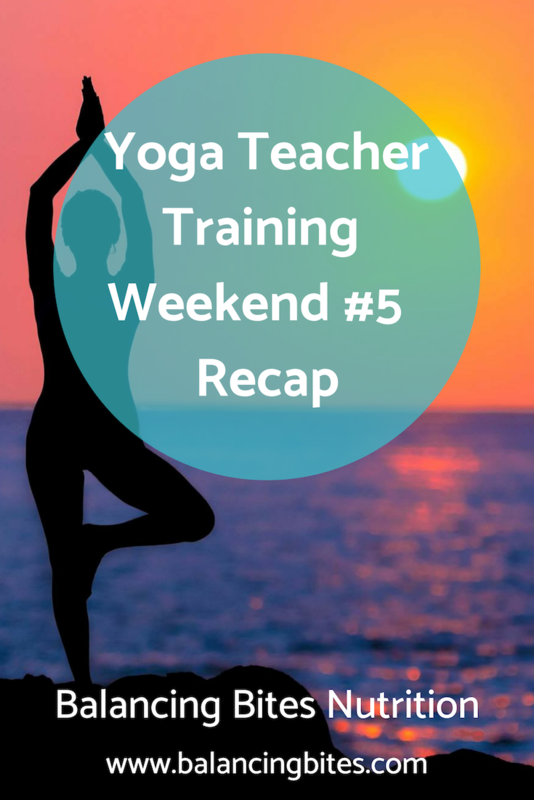 We had a bonus teacher training the weekend after YTT #5 at another local studio. The studio teaches hot yoga, which was not my favorite. It was my first time trying hot yoga and I thought I was going to pass out. Although it’s not my favorite, I would go back for the mental aspect of the practice. Guys, I wanted to quit so bad. Seriously! I didn’t though. After practice on Friday and all-day Saturday, we covered pranayama, chanting, chakra, meditation, and self-reflection. The studio owner and her husband provided a delicious Ayurvedic meal and yogi tea. It was a wonderful weekend and definitely one of my favorite YTT weekends. Guys, YTT weekend #6 starts tomorrow!!! I can hardly believe I’m almost done. I have two more weekends left after this weekend. This upcoming weekend we will have a yoga practice Friday, Saturday, and Sunday. We are going to practice teach, discuss the business of yoga, have an assisting workshop with Jen Eddins (Peanut Butter Runner), and a creating yoga magic workshop with Jen. It should be fun weekend. I hope you all have a wonderful weekend. Have you ever completed a 10 year vision? If so, what has been your experience? Have you ever done hot yoga? If so, what do you think of it?